Back after 2 weeks and the seas were rough, but the fish are there. Had about a 5 hour window headed south looking for signs. Some scattered weeds in 650 thinker line at 780. Set up the spread and it did not take long before we had a double knockdown. 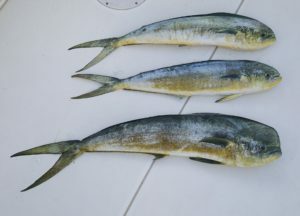 Left long is screening drag and right long is a jumping mahi. Left drag never stops and after a couple minutes the hook pulls. Fight the other to the boat and it is a 34” Bull. Work this area a little more and pick up a few 20 – 24” which go back to grow some more. Saw a bird working west of us so we set up the spread and pass by those weeds. Get another double hook up and after a nice fight a 29” cow in the box and 22” cow set free. This was not a meat trip so only looking to keep a couple. Move in to 650 and trolled a scattered line and picked up another Mahi this one 27” and bleeding so it went into the box. Last set up we got a hard knock down and the drag on 8500 slammer III was screaming. Tried to slow it down without success and it finally cut the line. Probably a wahoo that hit the only mono leader we had out there. Still a lot of action and a good day on the water.